Yes, we decided very, very late one night that we needed to go camping…indoors. 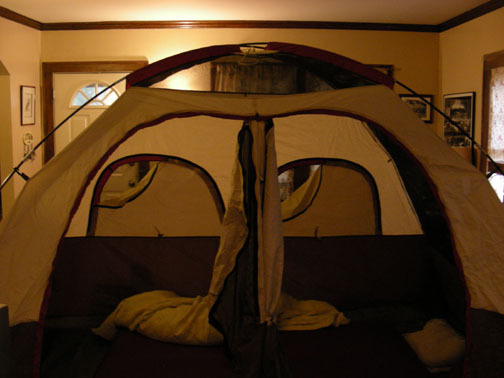 So we set up the huge tent (it was a wedding gift…see, this is what happens when you give a man one of those gun bar code zapper thingies and let him loose in JC Penny’s…this tent has a dome light that has a remote and can be divided into two rooms…did I mention the remote?!) in the living room. Um, there may have been some drinking involved, too. Just a wee bit. Anyway, we discovered that when 40 year-olds sleep on the floor (despite having stuffed the futon mattress inside the tent…yeah, that was an adventure, too) their backs protest alarmingly the next morning. The tent also freaked the dog out.